↑ David S. Kidder; Noah D. Oppenheim (14 October 2008). The Intellectual Devotional Modern Culture: Revive Your Mind, Complete Your Education, and Converse Confidently with the Culturati. Rodale. p. 228. ISBN 978-1-60529-793-4. Retrieved 21 July 2013. Dean was the first to receive a posthumous Academy Award nomination for acting and is the only actor to have received two such posthumous nominations. 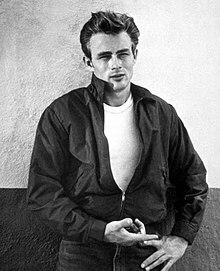 ↑ See also Joe and Jay Hyams, James Dean: Little Boy Lost (1992), p. 20, who present an account alleging Dean's molestation as a teenager by his early mentor DeWeerd and describe it as Dean's first homosexual encounter (although DeWeerd himself largely portrayed his relationship with Dean as a completely conventional one). ↑ "NOTABLE ALUMNI ACTORS". UCLA School of Theater, Film and Television. Archived from the original on October 6, 2014. Retrieved September 29, 2014.